When artists experiment with a new medium or process, audaciously moving from one that they’ve fully mastered to less familiar territory, new ideas often emerge that inform their work in unexpected ways. So it is with Melissa Meyer’s compelling new paintings at Lennon, Weinberg. 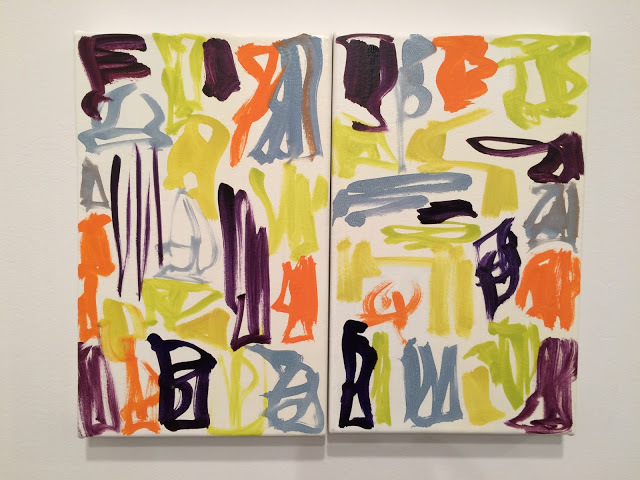 Melissa Meyer, Entangled, 2015, oil on canvas, diptych, 24 x 72 inches. In 2014, the State Department’s Art in Embassies program invited Meyer to create a large outdoor mural for the entrance to the new American Embassy in Bishkek, Kyrgyzstan. For this ceramic-tile project, Meyer, who customarily works in watercolor and oils, began using digital media. The result was a series of images in which color and composition behaved differently – in particular, they incorporated layered contrasts – and the experience of working digitally seems to have influenced Meyer’s painting practice. 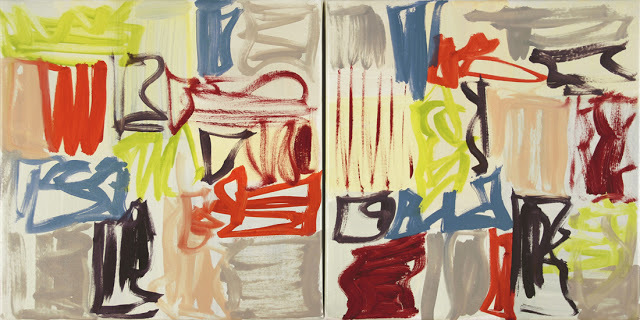 Melissa Meyer, Twain, 2015, oil on canvas, diptych, 16 x 32 inches. In earlier work, Meyer hewed to a loose grid formation in which the symbols, at once spontaneous and deliberate, floated on the surface. But in the most intriguing of the new paintings, such as Entangled and Twosome, Too, she has layered the symbols. Her signature marks, rendered in lively colors, are overwritten with even looser marks in thin washes of blue-black paint. In other paintings, like Twain, the marks are drier, and less fluid and looping than in previous work–aesthetic decisions that give the brushstrokes a new urgency. Melissa Meyer, Double Nature, 2015, oil on canvas, diptych, 16 x 20 inches. My favorite piece in this absorbing show is a small diptych called Double Nature. Meyer started by painting a basecoat of a faintly greenish off-white, and then added the familiar yellow, green, maroon, black, and blue-grey symbols on top. The off-white underpainting tempers an exuberant palette, establishing a complex and satisfying equilibrium. The symbols themselves seem less tidy than those in earlier work, with one thin, dark, elongated zigzag mark on the left panel drawing my attention. It resembles the type of angular mark that might be made on a computer in Illustrator with the pen tool. 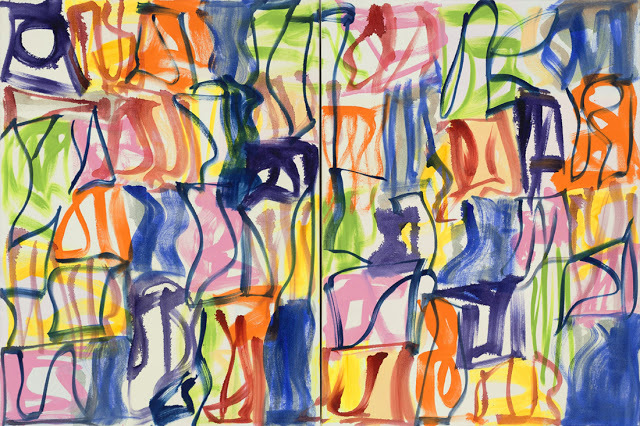 Embracing digital tools to make drawings for the Art in Embassies project has clearly spilled over into Meyer’s painting, prompting adventurous experimentation. “Melissa Meyer: New Work,” Lennon, Weinberg, Chelsea, New York, NY. Through May 7, 2016.